Ziyi estimates the pipes to be more than 308 years old. QAIDAM BASIN, Qighai Province ­– Chinese researchers have confirmed the extraterrestrial origins of the Baigong Pipes—a series of iron tubes linking a chamber on Mount Baigong to nearby Lake Tosun. 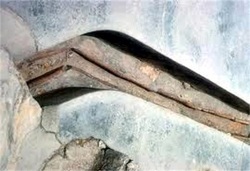 The scientists' report describes the ancient iron plumbing as part of a commode built by visiting aliens. "The facilities accommodated number one, two, or three," said archaeologist Dr. Wing Ziyi. Chemical analyses of the ancient washroom clinched the extraterrestrial hypothesis. Iron basins inside the chamber were found to contain traces of an antibacterial hand gel, effective against strains of heat-resistant and vacuum-proof microorganisms previously found only in meteorites. Ziyi has estimated the age of the Baigong commode to be between 308 and 460 million years. According to the scientists, the existence of advanced valveless siphon flush technologies so long before the evolution of human life on Earth is the strongest evidence of the commode's extraplanetary origin. “It's one of a very few Out-of-Place Artifacts, or OOPArts, which suggest an alien presence on ancient Earth,” said Ziyi. The Baigong toilet appears never to have been used, according to the researchers, and therefore offers few clues about the location of its designers' home world. Ziyi, however, has noted the apparent alignment of the commode with the constellation Reticulum. “This may have less to do with the stars than the direction of the winds on Mount Baigong,” Ziyi admitted. Ziyi's new book on these theories, Port-O-Lets of the Gods, will be published next year in English and Chinese.